Should you buy or lease a new Nissan? If you are not sure, we can help you weigh the different options to help you decide which one is better suited to your unique situation. Whether you want to drive home in a brand-new Nissan sedan, sport utility vehicle (SUV), or you would like to take your time browsing our selection of used and Certified Pre-Owned Nissan models, we will be by your side to answer any questions you may have. The professionals at our Nissan dealership near Canfield, OH, can go over the pros and cons of buying and leasing and help you come to a decision that you will be fully satisfied with. If you are a first-time car buyer or interested in building or repairing your credit, taking out a car loan can help you establish your credit history and build equity. Plus, once the loan is paid off, you will be able to drive your car for as long as you would like, but you will be responsible for keeping up with routine maintenance. If you lease a Nissan, you get the benefit of driving home in a brand-new Nissan with low mileage, and you have the flexibility of upgrading to a new model within a few years. We have excellent lease offers on new Nissan sedans, like the Nissan Altima and Sentra, as well as family-friendly SUVs like the Nissan Rogue and Pathfinder. And, no matter which car you are interested in buying or leasing, our Nissan specials can help you save even more money. Take a look at the chart below to help you decide if buying or leasing a Nissan is the better choice for you. Then, drop into Boardman Nissan to speak with one of our Nissan experts. ▹ You make payments toward ownership, and when you want to upgrade, you can trade in your vehicle. ▹ Buying a Nissan typically comes with a higher down payment, but you will also owe less over time the more you put down. ▹ You have no mileage restraints and can drive as much as you would like year after year. 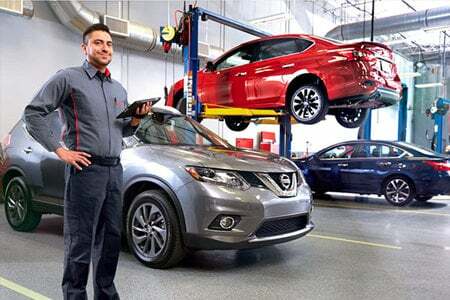 ▹ You are responsible for routine maintenance and emergency repairs, but you can customize your Nissan sedan, SUV, or truck any way you like. ▹ You can drive a recent model year Nissan with low mileage and at the end of your lease agreement, you can either return the vehicle or buy it. ▹ You can adjust the down payment for a lease based on what you would like your monthly payments to be. A down payment on a lease is usually lower than financing. ▹ Lease agreements will typically outline annual mileage limits and can bring on additional fees if you go over. ▹ You are not responsible for long-term care, and you do not have to worry about wear and tear, but you will need to return your Nissan in the same condition that it was leased in. See Boardman Nissan for details. Valid at Boardman Nissan. Valid on Infiniti, Audi, Mercedes, Lexus, Nissan, and Acura vehicles. See Boardman Nissan for details.